on Friday and Saturday only. IF you have been craving for some good old barbeque but just do not want the hassle of setting up your own grill, head on down to Rumbia Coffee House in De Palma Hotel Ampang where their new Gala BBQ Dinner promotion is taking place. At the grill, diners can expect the usual selection of meats including chicken, lamb and sausages with accompanying sauces such as mushroom, barbeque and mint. “We like to spice up the menu as often as we can so that returning customers can find something new. Our guests are mostly locals so our offerings are generally a mixed of cuisines,” junior sous chef Hamzani Che Husain said. 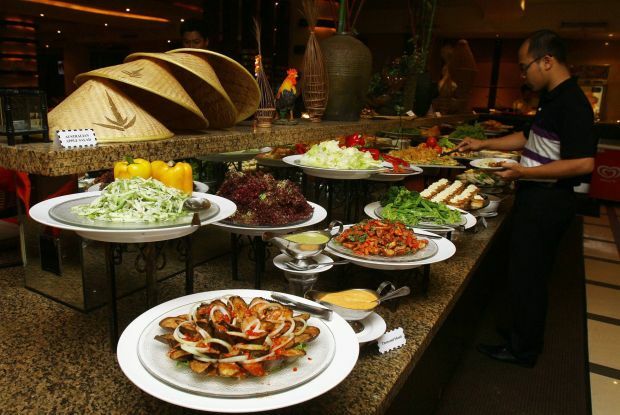 When diners finally tear themselves away from the mouth-watering offerings at the grill station, they still have between 80 to 100 types of dishes and dips to sample in the buffet. “Our buffet selection tends not to go into extremes or anything too unusual because it may not suit the diners’ taste. In fact, whenever we introduce something new, the decision to keep it on the menu is based on their feedback,” Hamzani said. But exotic dishes still do make their appearance at the buffet and are easily recognisable with names like the Australian Apple Salad, a treat from the starters section of the buffet that provides a refreshing zing to the palate. 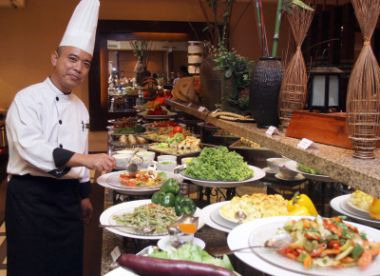 Mix cuisines: Hamzani (above) at the buffet table that offers of a mix of cuisines, with new dishes introducedperiodically to keep the interest of returning guests. Hamzani said that it was not unusual for them to find inspiration for new dishes based on popular dishes from other countries. Some buffet favourites around town such as fresh oysters and fried kway teow have also found their way to Rumbia’s dish selections. “We are always looking into new types of cuisines to add to the buffet. Next round, diners may see some Japanese additions like teppanyaki,” he said. A not-to-be-missed item at the end of the meal is the sweet and crispy pisang goreng that is made fresh at a stall, done up like a hut that oozes traditional charm, at the coffee house entrance. The price for an adult dining at the buffet is RM55++ per person, RM30++ for children between seven to 12 years old while it is free for children under seven years old. One family can only bring a maximum of two children below the age of seven.